Savory is a member of the mint family, commonly found in the kitchen spice rack. There are two kinds of savory, summer and winter, similar but with distinct differences. Both are warming and relaxing to the respiratory and GI tract and have long been used for colds, respiratory infections, bronchitis, asthma, gastritis, and colic. Summer and winter savory both contain volatile oils and tannins. 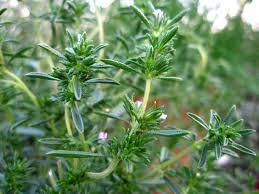 While winter savory is more hot and drying, summer savory is sweeter, and therefore more nutritive, and less warming. Summer savory is used as a warming and nourishing stimulant for a depleted body, specifically the endocrine and nervous system and for building up the immune system. Winter savory, being more pungent is used for its heating quality to help draw out toxins. It is ideal for cold moist conditions. Savory is most commonly used as a spice in cooking however it also works wonders as a tea or tincture. Sprinkle this calcium-rich blend over garlic toast, soup or bruschetta for a savory flavor. Combine 3 tablespoons dried nettle, 3 tablespoons dried oregano, 2 tablespoons dried savory, 2 tablespoons fennel seeds, 3 tablespoons celery seeds and 3 tablespoons dill seeds and store them in a glass jar with a tight-fitting lid. This blend has a shelf life of four months.